Mandy Lennox is looking for a new opportunity to prove herself - and Duncan&apos;s idea of starting a Security Company with other Vets that were injured in the line of duty is just the thing. Unfortunately, Duncan is reluctant to let an ambitious socialite anywhere near his business plan. But Mandy doesn&apos;t plan on letting that stop her. The Soldiering On series are standalone romances featuring former military heroes and heroines proving to the world they still have what it takes, and falling in love along the way. I agree with the reviews on Amazon.com - this is the start of a great new series. I really enjoyed the sympathetic characters and the sexiness portrayed in Station Alpha, so I had to read the prequel Soldiering On. Kearns has again deftly handled the challenges facing returned service personnel. What a refreshing concept for a romance thriller – wounded yet buff and proud returned soldiers who are building productive exciting lives back home, and rediscovering passion. Kearns introduces them all in this prequel. The bond between them is strong and they are so supportive of one another. I was particularly curious to find out more about why Duncan and Mandy’s relationship as business partners, seemed so uncomfortable. I loved the way that Kearns describes Duncan’s awkwardness around Mandy and his difficulty in accepting that she may actually find him attractive. Mandy is terrific, as she stands up to her powerful father and decides to ‘insert’ herself into Duncan’s life. So many delightful moments too, like when Kearns writes “Duncan did what he usually did when he was trying to solve problem: he called his mother”. What wonderful characters! I want to hang out with these people! 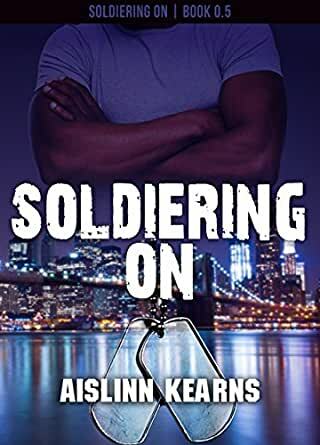 This is the prequel of a new series (Soldiering On) by Aislinn Kearns, and having read this story and book 1 (“Station Alpha”), all I have to say is that both books are amazing, a pleasure to read, with their well-rounded characters and interesting plots. The topic of the security firm (Soldiering On) employing injured veterans, using their skills and know-how, is not original, but Kearns delivers it superbly creating wonderful, lovable and believable characters. I enjoyed the relationships dynamics, specially the one between both partners (Duncan and Mandy) in the firm. I think they’re perfect for each other. bickers, but deep-down he's compassionate and caring. And even if I loved the romantic couple in “Station Alpha”, and their growth as characters, I’m thrilled with Duncan and the way the heroine is falling for him, imagining his “blunt male fingers” “running over her body” or appraising “his smooth black skin”. I loved the diversity of the cast of characters introduced in this short prequel to the series. I'm the kind who always has to read the blurb, gotta know what a book or movie is about before I start it. I love intro stories like this because it gives a good glimpse into characters and relationships before you get to the actual series. The back story information you get is wonderful and only adds to the depth of the characters. I read the excerpt from the first book that comes with this story, and I'm glad i did read this prequel. Like I said, I have to know what's going on, and this gave me a better understanding of what some motivations may be. 4.0 out of 5 starsNice intro to what looks to be a great series! Nice intro to the series! Focuses on all the main characters and the startup of the company to give permanently injured soldiers a chance at a new, fulfilling career. Duncan and Mandy are co- owners and the stage is set to see whether they will become more than business partners. There is no romance in this prequel, but I'm looking forward to seeing who all these ex-soldiers, male and female, will end up with! Soldiering On is a short prequel to the Soldiering On series by Aislinn Kearns. In this story, readers are introduced to Duncan, an injured veteran who is looking to make a life for himself following his military career. Deciding to use the skills and know-how acquired in the military, Duncan embarks on a quest to open a security firm staffed by other injured vets. While Duncan is very confident in his ability to handle the security side of the endeavor, he has almost no confidence in his ability to handle the business side. When Duncan meets Mandy, a woman with a lifetime of business experience, the two join forces to get the firm, Soldiering On, up and running. This prequel serves as an introduction to the characters and provides some background as to their injuries and how they are dealing with those injuries. In the case of Mandy, readers learn what has propelled her to seek out something new in her life. While there is no romance between any of the characters in this book, Soldiering On is a romantic suspense series, so I’m guessing that’s coming in the books that follow. Soldiering On is well written with characters I found myself caring about. I look forward to learning more about the business as well as about how the veterans learn to adjust to life outside the military. Veterans and those in related fields should like this book for several reasons. Determination to overcome combat related injuries and utilize skills learned in service is a good place to start a new life when it is needed. The author made mention of the fact that a person in this type of situation must deal with what happened to them and be ready to accept their change in circumstance. No one can take those steps for another person. This is a first step to being successful in a new situation. The characters are well developed making it easy to follow and their reactions believable.